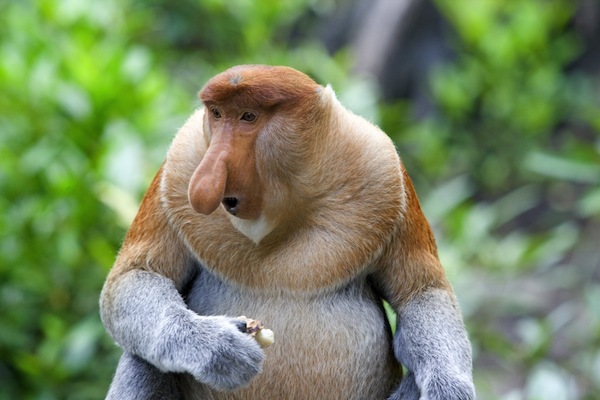 The Proboscis monkey can also be known as the long nosed monkey. In Malay, the animal is known as Bekantan and is an old world monkey. This animal is primarily found in South East Asia, in Borneo. This is a beautiful Old World monkey is a very unique animal. The Proboscis monkey is quite large; in fact, this type of monkey is one of the very biggest species in the whole of Asia and is exclusively native to the continent also. There are very few other species of monkeys which can actually match the Proboscis monkey in terms of its size and strength. The males will have uniquely shaped noses which are elongated pendulous noses. These noses can be measured over 10 centimetres! The noses can hang down over the mouths. Their cheeks, throat, nape and shoulders are mostly a pale orange shade; but their legs and back are a red and grey. It’s the same with their rump and belly areas; though their tails are a shade somewhere between white and grey. Juvenile Proboscis monkeys have blue faces until they are 3 years old; but adults will have pink faces. The Proboscis monkeys have partially webbed feet so that they can swim which they do love to do on occasion. Though, in terms of their size, the males are bigger than females. The males can weigh up to 50 pounds and be anything up to 76 centimetres in length; whereas a female is only 62 centimetres in length and weigh 26 pounds so there is a considerably weigh and size difference. Even though the females are smaller than the males, they are still in fact, a considerable size for a monkey. Where Do the Proboscis Monkey’s Live? 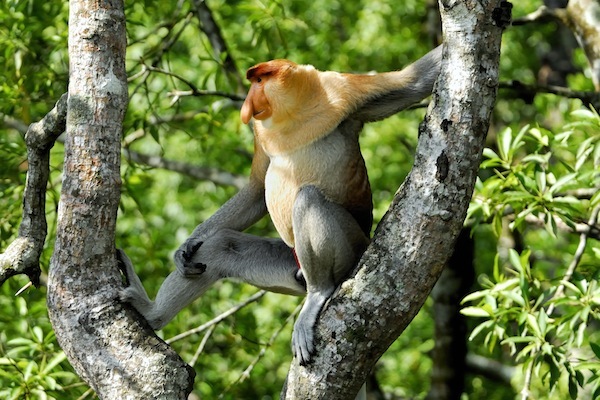 Proboscis monkeys are found in the 3 nations of the island of Borneo, including Malaysia, Brunei and Indonesia. Most of the time, these Proboscis monkeys can be found near rivers and coastal areas also. They are restricted to those areas; but they can be seen in swamp forests as well. Since Proboscis monkeys are good swimmers, they don’t mind being near the coast and they love the lowlands which have tides coming in. They don’t stray too far from a water source and the Proboscis monkeys are amazing swimmers. They can swim underwater as well as on the surface and they have been known to swim from one side of a river to another. Proboscis monkeys usually like to live in groups. More often than not, there is only one adult male in a group with a few female adults and some offspring of the females. There are some groups which are just consistent of all males; these can be monkeys which prefer the solitary life and live away from larger groups. There is not much territoriality however amongst these animals because there is a lot of overlap. Most groups will travel throughout the day together but those in their own groups will interact fully with one another. There is also no serious aggression between animals, male or otherwise because they are relaxed animals. One or two scuffles are known to break out from time to time but nothing too severe. Proboscis monkeys do make vocal communication. The male will sound loud, usually he will honk; and there are special honks for infants and calls for reassurance also. However, males have been known to sound calls when there is danger coming. Males and female monkeys will give threat calls but every monkey is very different from the next. What Do Proboscis Monkey’s Eat? Most of the year, Proboscis monkeys eat leaves, seeds, insects, flowers and fruit – mostly unripe. Though, insects are eaten only occasionally and not exclusively. There are over 50-55 different types of species of plant which are consumed by Proboscis monkeys. The monkeys tend to eat more fruits during the months of January through to about May; and leaves the rest of the year. Most females will become matured at the age of 5; their reproductive organs will become swelled and reddened. Usually the mating season will occur between the months of February and November with the resulting mating births occurring in March, April and May. Some mating rituals will not be very successful.